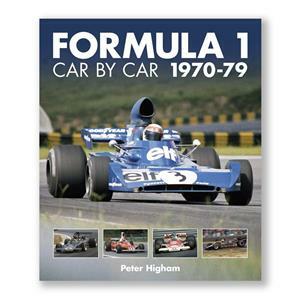 This book is the second in a multi-volume, decade-by-decade series covering the entire history of Formula 1 through its teams and cars. This instalment covers the 1970s, when the sport gained big new sponsors and grew into a television spectacle, with battles between Ferrari and Cosworth-powered opposition a continuing theme. As well as the big championship-winning teams Ã» Lotus, Ferrari, McLaren and Tyrrell Ã» this was a period when small teams and privateers continued to be involved in significant numbers and they are all included, down to the most obscure and unsuccessful. This book shines new light on many areas of the sport and will be treasured by all Formula 1 enthusiasts. Ã²Year-by-year treatment covers each season in fascinating depth, running through the teams Ã» and their various cars Ã» in order of importance. Ã²World Champions: Lotus and Ferrari, with three driversÃ† titles each, were the most dominant race winners through the decade, while Tyrrell and McLaren took two driversÃ† titles apiece. Ã²Other winning marques were Brabham, BRM, Hesketh, Ligier, March, Penske, Renault, Shadow, Williams and Wolf. Ã²More obscure teams and cars in all their colourful diversity are a special dimension of this book, with names such as Amon, Connew, Eifelland, Ensign, Hill, Kojima, LEC, Maki, Merzario, Rebaque, Token and Trojan. Ã²Over 600 photos Ã» mostly in colour Ã» show every type of car raced by every team and driver, presenting a comprehensive survey of all participants. Ã²The sweep of the decade covers sustained technical development, particularly in aerodynamics, tyres and engine turbocharging. Ã²Detailed text includes car specifications and technical essentials.